This book sheds light on an almost unknown military campaign conducted by a French army, 100,000 men strong. 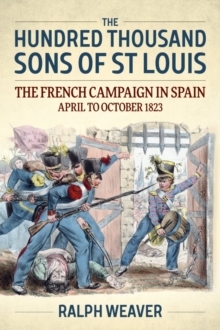 The army was referred to by the French king as the `Sons of St.
Louis' and was pitted against parts of the regular Spanish army and a numerous militia. The cause of the war was a revolution in Spain in 1820 which brought in a `Liberal' government and the Spanish parliament, the Cortez, held Ferdinand, the Spanish king, a virtual prisoner. Ferdinand appealed for help from the French who were supported by an army of Spanish Royalists. A few years earlier many of these Royalist volunteers had been France's bitter enemies and had fought Napoleon's generals to a standstill. The French troops who crossed the Pyrenees were part of a newly-forged army, taken from the debris of Napoleon's old regiments augmented with newly-raised conscripts and many inexperienced officers drawn from emigres and the old nobility who had returned to France after the Battle of Waterloo. However, it was led by battle-hardened former Imperial officers and was placed under the overall command of the king of France's nephew, who was also in line for the throne of France. Since 1824, when a small number of works appeared in France, there has been no book on the subject, in any language. A full account of the campaign is given, together with detailed descriptions of the armies of France and Spain, illustrated with contemporary pictures and modern interpretations and including maps and plans of the war. The final and crucial battle, the taking of the forts on the island of the Trocadero, opposite Cadiz, is given special attention. Although small by recent European standards, the fight was decisive for bringing about the end to the war and for establishing the spirit of the new French Royal army and restoring France to a position as one of the leading world powers. The organisation of the armies, and the uniforms of the post-Napoleonic French forces is covered in detail. The critical book list adds to the reader's understanding of the sources used.